A week for only Â£2,995 plus air con! Set in spectacular grounds and on three floors with both indoor and outdoor heated swimming pools, air conditioning throughout, seven bespoke bathrooms / shower rooms, a multitude of large sumptuous public rooms, a professionally equipped gymnasium and games room, an eight seat private cinema, Wi-Fi / Broadband and numerous outdoor terraces and balconies and an additional self contained apartment. 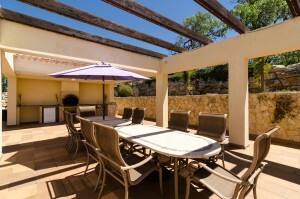 Casa Ferrel is available from 3pm on the day of your arrival. Â Â Â Â Â However, if the time of your arrival happens to fall before 3pm,Â arrangements can be made to securely store your luggage.